Not an exact copy of the Brian May sound, but it will get you in the neighborhood with the need for a dozen AC30s or funky old car radios. 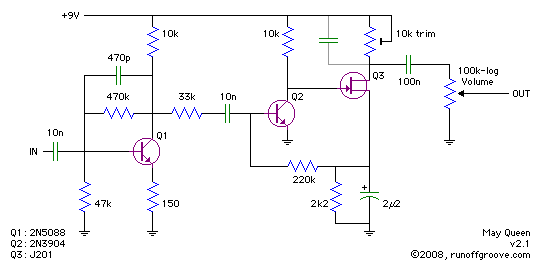 Good distotion, smooth highs, and mids with excellent harmonics are the main features of this circuit. The optional cap in parallel with the Q3 bias trim is a high end filter. Larger values will yield less treble content. A good starting point is 2n2, then adjust to your taste. There is no gain control. This circuit is intended for full gain all the time. Thanks to Gus, Aron, Robb, etc. 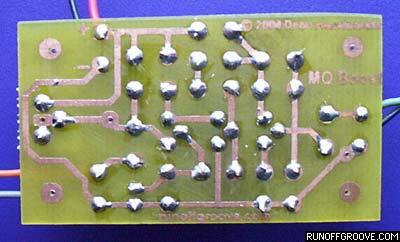 JD Sleep sells a ready-to-solder PCB for the May Queen, shown below. 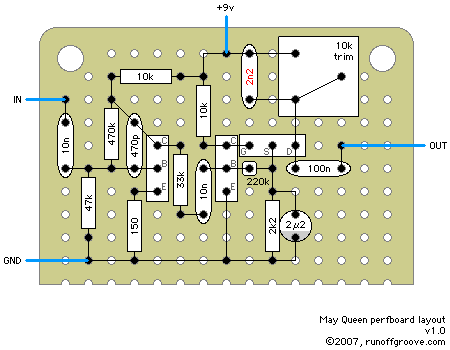 W. Percival kindly contributed a PCB layout (PDF, 53k) for the May Queen. 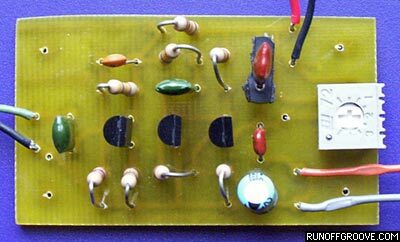 Note that this layout differs from the PCB sold by JD Sleep, which was designed by Dean Hazelwanter. May Queen by runoffgroove.com is licensed under a Creative Commons Attribution-NonCommercial-ShareAlike 3.0 Unported License.